Verse about commuting in Northern New Jersey. Feel the rhythm of the rails as you travel the last days of the Newark City Subway, or the PATH, and be relieved you are not present to hear the Preacher Man or Mr. Tourette's but do listen for the noise above the hum of the wheels and turn your ear to the voices on the bus, train or standing nearby on the platform. Commuting daily on the bus, train, subway or PATH, one settles into a routine of familiar seating and faces. You can stare out the window listening to your own music, or read a book, or write poems about the experience. This is the latter. Working class verse and tales, musings and random observations about commuting in Northern New Jersey. Published by Cherry Blossom Press in 2008. Buccino's poetry collections are mostly out of print. Special orders - send email to author. 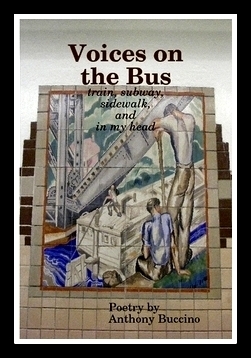 At recent poetry readings in northern Jersey, I've been delightedly surprised when a poet reads a work and it has to do with commuting. No. Really. Poets and scribes jot down notes about egrets in the meadows as their train thunders by and about regrets in their heart as the rhythm of the rails leads them to remembering. Recently, at the Les Malamut Gallery at the Union Public Library, Leona M. Seufert selected pieces to read from her chapbook From Here To There And Back Again - A Commuter's Journey. She reminded me of things I've thought and seen as my PATH car rolls east or west. If you've crossed the Meadowlands in day time, then you've seen what's left of the great glacier. I've written a poem about Fraternity Rock as viewed from the PATH. So, I shouldn't be too surprised to learn that others have written about egrets and regrets. So, what you have here is the start of my effort to capture the difference from day to day of everyday commuting. In prose poetry, of course. You may see some new stuff, and some old stuff. But if you commute to work via public transportation, you should see a lot of the familiar you've overlooked. Transit modes include, NJTransit, PATH, Newark City Subway, NJTransit Lightrail, foot path, automobile and daydreams of jetpacks.